Neutral Concrete is an ideal hue to create a background of quiet strength. The soft ivory color flows within the overall aesthetic, creating an exclusive design statement. An unexpected piece of furniture that can be used singularly or in a combination of different sizes. The occasional furniture also offers the highest quality, even better if combined with art deco, a timeless style, creating endless Luxury. Weight: 3 kgs Structure in steel wire and sheet with a powder coated finish. ... coated steel | 37 x 37 x 115 cm and 42 x 47 x 60 cm | 2007 Table with cubistic construction elements which functions as a pedestal to display ones dear belongings. A pedestal is a freestanding base for the display of a vase, a sculpture or similar object, or to support a light column. Primarily decorative, these items are common in both residential and professional settings. Weather-resistant versions can be used outdoors. Before choosing, it is important to determine the object to be displayed. 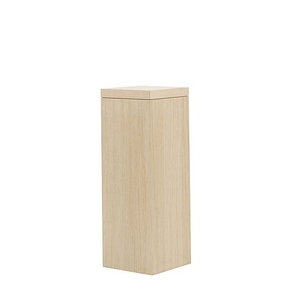 Pedestal height and width will depend on specific function and location, interior or exterior. Select a version that harmonizes with existing decor.